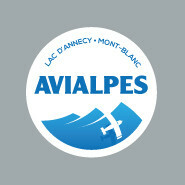 AVIALPES was founded in 2012 at Annecy's Haute Savoie, Mont-Blanc Airport. Our company operates every day. We invite you on one of our scenic flights to enjoy our beautiful area by flying over Lake Annecy, the Aravis mountain range and the Mont Blanc, Europe's highest mountain. Our experienced mountain pilots will be pleased to welcome you aboard our airplanes with an incredible panoramic view. You can also "take the controls" thanks to our introductory flights! Will you give it a try? If you want to continue your flight training come see us for a personalised pathway to certification. For more experienced pilots, we also rent our planes. The Avialpes Company has an Air Operator Certificate (CTA F-CE 051), and is an Approved Training Organisation (FR.ATO.0136), in accordance with current legislation.